The restaurant business is competitive – get ready to make your rivals eat their hearts out. Word of mouth means a lot in the restaurant industry, but that doesn’t mean that your marketing isn’t also important. Get your customers’ mouths watering with an inviting website or a vibrant social media campaign that shows off your best work. There are two keys to success for any restaurant – the ambiance and the food. For anyone who hasn’t had the experience of dining with you, your marketing can reflect the best of both worlds and bring curious customers through your front door. We’ll help you create a website that features tempting imagery and user-friendly, search optimized menus that work perfectly on every device. Ready to dig in? We can design and build you a beautiful website that communicates your vibe perfectly, whether it’s upscale or downtown. We’ll also help get your social media strategy on point and let your customers do the hard work of doling out those word-of-mouth referrals. Viva Design Studio acts as the hub of a network of trusted digital marketing professionals that can keep your menus up to date and your website doing all the work of an extra employee. We’ll act as the coordinator for your marketing efforts, and you’ll work directly with our associates for these additional services. Strong SEO and social media strategy may be more important for restaurants than for any other market. Local search is critical for your foot traffic, and Adam can help you outrank the competition. He’ll also get your social channels whipped into shape and filled with imagery that will have customers beating down your door. The day-to-day for any restaurant is already hectic – do you really want to have to worry about your website, as well? Josh will keep your menu up-to-date and your site in tip-top shape with regular software updates and security upgrades. This specialty cheese producer in Fairfield, NJ, began as a family business that delivered cheese from a horse-drawn wagon in 1929. The company sells premium Italian cheeses, such as ricotta and mozzarella, to a variety of institutional, food service and private label customers. We helped the company build a brochure website to represent the brand online. 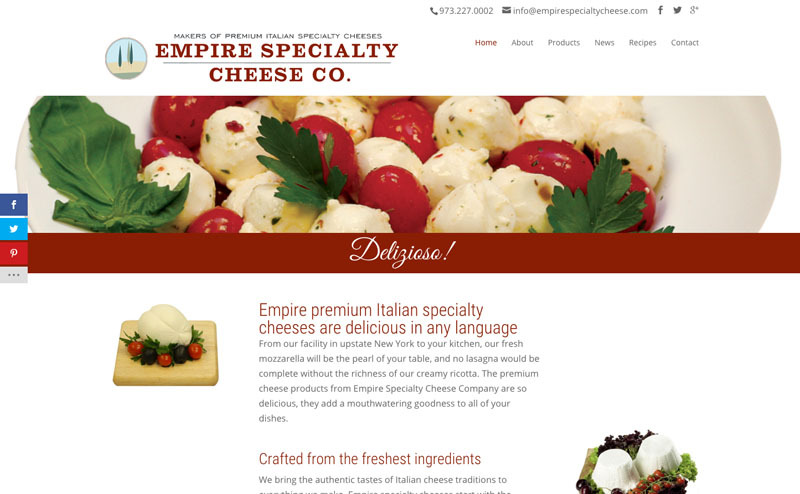 Their site included information about their full product line and their cheese-making process, as well as recent media coverage and some traditional Italian recipes. The site also included an email newsletter to support the company’s customer outreach efforts. The company was recently sold to an Italian cheese conglomerate. Ready to take a bite out of your competition?